Sachin Ramesh Tendulkar says he was confident that India would beat an Australian team weakened by the absence of Steve Smith and David Warner in the recent four-Test series. He gives full credit to Cheteshwar Pujara, who compiled 521 runs at 74.42 in seven innings, for being the main pillar of the Indian batting. Fast bowlers, of course, were the architects of the 2-1 triumph, so nearly 3-1 if not for the bad weather in the Sydney Test. In an interview with Qaiser Moha­mmad Ali, Tendulkar, 45, spoke his mind on various aspects of the glorious win. Were you expecting the Test series win in Australia, considering the 1-4 defeat in England and the 1-2 loss in South Africa? Very much so, for I don’t feel this Australian side was a strong one. They were an ‘okay’ side, to be honest. If you look at their batting performance, it wasn’t that great. I felt South Africa and England were much better opposition. England was far more settled as a team and Australia is right now going through a phase where they’re looking to settle their team. With Steve Smith and David Warner out, they felt a vacuum there. I was 100 per cent expecting India to win because we’ve a nicely settled and balanced team that’ll be competitive in any part of the world. What were the reasons for the turnaround after the defeat in England, as the morale of the players must have gone down? We played those crunch moments better in Australia, whereas in England we couldn’t manage to do so. England put up big batting partnerships on the scoreboard whereas the Australian side struggled to build big partnerships. Also, when you are playing against an opposition that is weaker, you start on a different note altogether. You mean that the defeats would’ve been wiped out from the players’ minds by the time they reached Australia? You’ve to move on. And before Australia, we played the Windies in India [and won 2-0]. As a sportsman you’ve good and bad moments, but you move on. Even when there are good moments it doesn’t mean you get stuck in those moments because you’ve to immediately start preparing for the next match/day/session. So, whatever has happened is in the past. You’ve to be constantly in the present and prepare for the future. How much of a factor was the change of conditions and pitches from England to India to Australia in India’s win Down Under? An international team is expected to make adjustments according to the conditions. In swinging-and-seaming conditions you’ve to be on top of your game, and so is the case when there’s extra bounce or extra turn. It’s a challenge and one needs adjustments. These days, when teams—India A, India Under-19 etc—are travelling so much, you get time to understand surfaces. And most of our players had toured Australia, so they knew what to expect. At times, Indian batting failed in Australia, like in the second Test, which we lost. Is that a concern, without taking away anything from the grand win? Ups and downs are going to be there. How we come back [after reverses] is equally important. Perth [second Test] wasn’t a good game for us. But in Melbourne we came back really stro­ngly. There will be odd games when things don’t go according to plan. But if you are playing to your plan and performing well, we should look to build on that. Winning is a wonderful habit. The difference I find is in the mindset. When you’ve won a few games and are faced with a difficult situation you still feel you can win from there. Exactly the opposite happens if you’ve lost a few games, and if you are in a winning position, you still sometimes feel, ‘I better not lose from here’. So, it’s finally about the mindset of the team. Cheteshwar Pujara continues to be India’s batting mainstay [521 runs, including three centuries, in seven innings]. But at times we’ve seen when he fails, India too fails, like in the second Test. He’s one of the leading players, not just in India but one of the leading Test cricketers in world cricket. He batted fantastically. A number of experts said he batted too slowly and took too much time. I think all of them were speaking too much too soon. It was the number of hours [31 hours] and balls [1,258] that he played set a solid foundation for rest of the batters to come and capitalise and also for the bowlers to go out and put pressure on the Aus­tralian batsmen. Is it a blessing in disguise for Pujara that he is not being picked for the shorter formats, as that certainly helps him concentrate fully on Test cricket and succeed? Credit is due to Pujara that he hasn’t let all those things affect him. He’s gone to become one of our main batsmen and a world-class player without any doubt. One would be wanting to be a world-class player in some format rather than an average player in all formats. It’s about adaptability. You ask any player and he would be able to adapt, but to bat the way he batted in Test cricket is not so easy. It requires that special skill, preparation, pat­ience to have a vision and planning, and then execute that. What do you think of Virat’s captaincy in Australia? I think he has been a very good captain for India and has led from the front. The field placements that he had were attacking, which put the Australian batters under pressure. He was able to get the best out of the bowlers. Rishabh Pant put up a much improved performance in Australia, compared to his show in England in the summer. Yes, I think he has played an important role. Without any doubt, his contribution was very important. When you have someone scoring runs consistently at No.7, he becomes an asset to the team, and that’s what he has done. He contributed really well and at critical stages in Australia. And has Rishabh Pant’s wicket-keeping improved? I haven’t really followed his wic­ket-keeping closely. However, the ball wobbles more in England than in Australia. It can be sometimes harsh for the wicket-keeper when the ball starts wobbling once it’s past the stumps. Wicket-keeping in Australia is easier than in England. Do you feel Pant could be one of the wicket-keepers for the World Cup in England this year? I would be tempted to pick him bec­ause I am sure the team would have a back-up wicket-keeper. M.S. Dhoni is obviously in the frame for the World Cup as the selectors continue to keep trust in him. He has been a terrific contributor to Indian cricket for a number of years. He has been able to absorb a lot of pressure and perform well. So the selectors have rightfully shown confidence in him. When it comes to reading the game and the situation, he has that ability. Jasprit Bumrah bowled outstandingly well not only in Australia, but also in South Africa, England and at home recently. 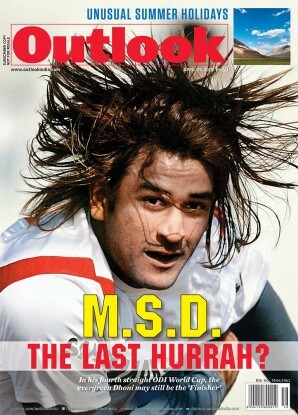 I’ve seen him right from the beginning, from the time when he hadn’t even played a single game for the Mumbai Indians. From thereon, I’ve seen him progress as a bowler. He’s a quick learner, a good listener, and he’s got a balanced head. His thought process is simple. He’s been our main fast bowler without a doubt, someone who has consistently bowled well and taken wickets. I hope this is only the beginning of a wonderful career. Overall, we not only have a good bunch of fast bowlers in the team but also on the bench, the likes Moham­med Siraj, Khaleel Ahmed and Sidda­rth Kaul, that gives hope. That’s a blessing because there could be injuries every now and then and that’s when the bench strength is going to come into play. If you’ve a good bench strength, it alw­ays helps, and we are in that fortunate position. One interesting aspect is that while Punjab in Pakistan has produced a lot of fast bowlers, Indian Punjab hasn’t produced as many tearaway pacers, des­pite their food habits, culture, lifestyle and language being the same. What could be the reason? I feel that Pakistan has alw­ays had fast bowling heroes and that motivates the next generation to bowl as fast as one could. India has, traditionally, had batting and spin bowling heroes. Yes, we have had Kapil Dev, Javagal Srinath and Zaheer Khan as fast bowling her­oes. However, we’ve developed fast bowlers now because the infrastructure is better, there’s more awareness about training methods and diet, accessibility to internet for any information that you want, and a more organised set-up. That’s why you are seeing a number of fast bowlers and [a strong] bench strength also. IPL has allowed a lot of youngsters to not only compete with the best in the world but their expo­sure to the selectors and cricket loving fans has also increased. As a tournament, IPL is a huge platform. But it’s a double-edged sword. If you are foc­ussed on your game, it works in your favour, otherwise it can go against you.